And I’m sticking to that. After I stopped to see her on Friday, she told me that I really needed to check out the new shop Fibre Space, just a couple of blocks away. I had some time, so I decided what the hell. I walked over, and entered the door of a really lovely new shop. They’ve got beautiful yarns (all different lines than are carried at Knit Happens), friendly staff, and a great classroom space. It’s probably a good thing that I don’t get to Alexandria all that often. It could be dangerous. Three skeins of Spud and Chloe Sweater in “Toast”, which called to me from the shelf and said it wanted to be a Milkweed Shawl (which I’ve been drooling over on Skyline Chilly of late – she’s made two), two braids of merino-bamboo top from Miss Babs in “Frogbelly” (how could I resist a name like that? 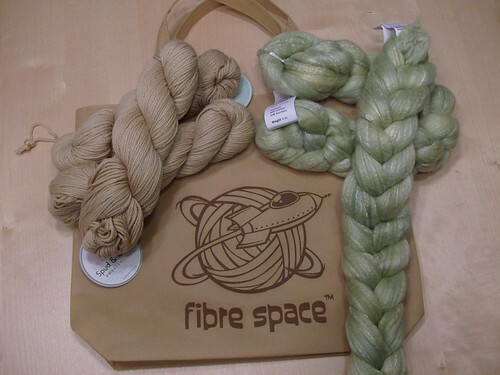 ), and a drawstring reusable bag from Fibre Space. They aren’t doing paper or plastic bags, so you can either grab one of these cuties for $5, or bring a bag. If you get a chance, DEFINITELY check them out. I did hear one of the employees mention that they are still adding more yarns to their stock, so I’m looking forward to another trip to check it out again! August 3rd, 2009 | Tags: Knitting, Spinning, Yarn Acquisitions | Category: Misc. Coolness! Loving the yarn and the roving. The bag is awesome though! Oh, those yarns are lovely. Covet! Frog belly! Frog belly! Do you chant it like pink belly! Pink belly! Hee hee! I do like that color! Spud & Chloe? I know where I wanna go next time I’m up! I really want to check out Spud & Chloe, but my LYSO passed on it at market, so who knows when I’ll be able to fondle in person. My LYSO also stopped in at Fibre Space the same day you were there, since I believe the owner is a ‘Burgher. Maybe I can sneak by on my next trip to the DC area!